Local farmers have made clear their concern for the wildlife that have come to rely on the network of stock tanks in the Wah Wah district. 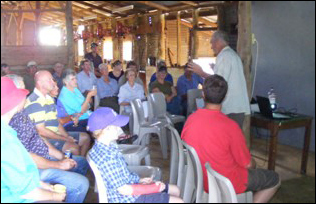 A Landcare field day held on the eve of our national day of celebration saw families gather at 'Galah', north of Hay, to learn more about the wildlife that use the stock tanks and discuss what might be done to soften the blow when the new pipeline goes ahead. 'Galah' owner and Hay Landcare chairman Ian Auldist said it was heartening to see about 50 people come together, united with a common interest in the welfare of local wildlife.